Jaguar suspension? In *my* classic? It’s more likely than you think. MOAR drivetrain stuff below. The whole drivetrain to this point. Sharp eyes will notice fluid filled motor mounts of Teh Awesome at the extreme top of the picture. 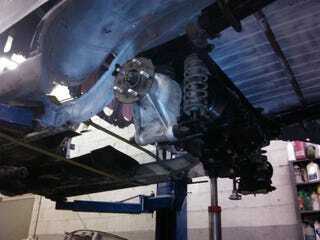 ^Horrible blurry picture from the side that nonetheless suggests I need some oil pan editing. Low CGs, broheim. Grounded to the ground. At least it’s better than trans clearance - see below, that I have had to edit my cross-brace. A bit. Notice that the reverse shift fork is actually behind the crossmember, while the other two are in front of it. Pic taken before I had the trans on its mount, obviously.